This Highlands NC home for sale on Owl Gap Road is an elegant custom 4 bedroom, 5 bathroom home on a 4.26 acre lot. The location cannot be beat, in the beautiful community of Falling Waters just 5 minutes from downtown Highlands NC. An amazing waterfall and exceptional views compliment the stunning craftsmanship of the home. This stunning Highland NC home has 4 fireplaces, heart of pine flooring, bark and cedar siding, and Brazilian walnut decking. The great room is warm and inviting, featuring vaulted wood ceilings and large windows that embrace the views and fill the room with an abundance of natural light. The lower level of the home is perfect for guests. Here you will find two bedroom suites and a family room with a fireplace. The master suite is on the main level, spacious and bright with a spectacular bathroom complete with a luxurious soaking tub. There is an additional guest suite on the main level. The wonderful covered porch will become a favorite spot for relaxing or entertaining. Here you will find a stone fireplace, perfect for cool mountain weather. Enjoy views of both Satulah and Little Yellow Mountain from this magnificent mountain retreat. 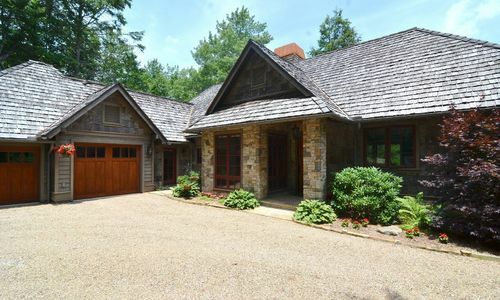 This Highlands NC home for sale truly capitalizes on mountain living! Contact our team at Berkshire Hathaway HomeServices Meadows Mountain Realty today to learn more about Highlands NC real estate. We welcome the opportunity to help you with your property search. Let our knowledge and experiences serve as your guide, helping you locate the ideal Highlands NC home for sale for you and your family.